Hugh Bennett, news editor at right-wing blog Guido Fawkes, took to social media on Thursday night after the ‘Revoke Article 50’ petition had passed the 1 million signatures barrier. The tweet got picked up by the Independent MEP, who could soon be officially registered as leader of his new Brexit Party in the coming weeks. He seized on the irony of ‘Russian involvement’ in a pro-EU, UK petition, arguing that an inquiry was needed. Bennett also noted verifiable interest in the stop Brexit petition from other countries such as Saudi Arabia and even North Korea, which has one signature. It couldn’t be from the big man, surely?! The tweet triggered an avalanche of seemingly irate Remainers, not seeing the funny side and instead insisting it was “fake news.” Others living in various countries around the world felt the need justify their signatures. I’ve signed from abroad, as I’m entitled to do. Anyone either resident in the UK or a UK citizen may do so. What evidence do you have that there is large scale fraud? I can tell you Brits living abroad are signing in large numbers, especially as so many were disenfranchised. I signed from Sweden. There was a nice box I ticked; "Are you a UK resident or UK citizen". Yep! Russia has been at the center of accusations concerning ‘collusion’ in foreign nations’ internal affairs, from the 2016 US presidential election to the 2016 EU referendum in Britain, despite a lack of concrete evidence to support such claims. 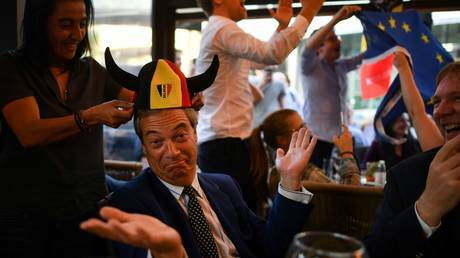 Farage announced on Friday that he will lead his new Brexit Party into the European elections if UK MPs decide to delay Brexit beyond May 22. At the time of publishing this article, the petition had broken the 3 million barrier.